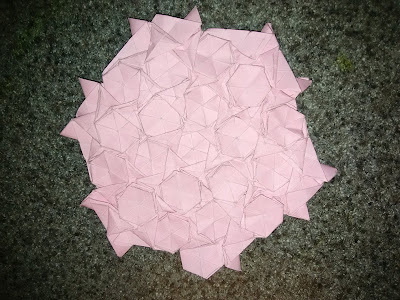 Here's a rather crowded tessellation. 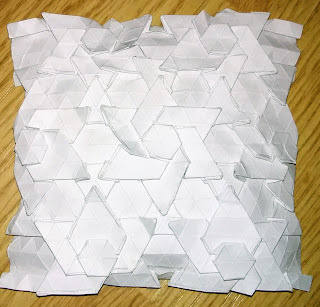 Hexagons surrounded by triangles. 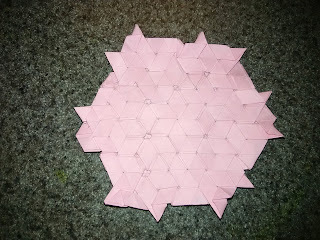 The backside make a tight weave pattern. 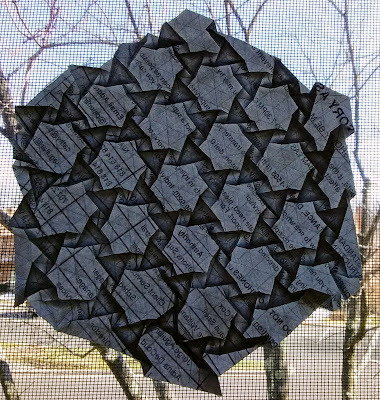 The front is a chaos of triangles and hexes all banging into each other. I tried backlighting it, but it's so dense that no light shone through. It'd probably look prettier with the repetitions spaced more generously to allow some light to come through in the gaps. That may already have been done by someone somewhere. It rings a little familiar. Still the unlit version has its merits. 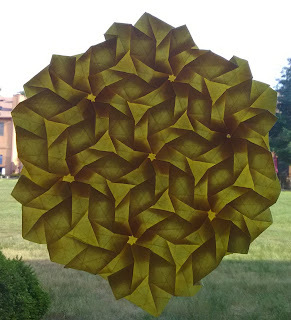 It's kinda fun to play around with the overlays of triangles and hexes. You can get different patterns bases on which shapes are on top/bottom. My paper didn't really want to cooperate. I wanted all the triangles on top. But every time I put some of the triangles on top of the hexes, some of the other hexes popped up on top of the triangles.That might be a problem with my choice of paper. Or it could be the design simply isn't able to do what I envisioned. I wonder if something more three dimensional is also possible using this framework. It certainly seems like a possibility.